I have been playing Irish pennywhistle since 1991 and wooden flutes since 1994. I play regularly in sessions in Houston, and play concerts, festivals and private engagements with two groups. Over the years I have composed a few tunes in the Irish idiom. Some of these are featured on my two solo CDs, and a few have become session standards in Houston. I also collect and restore antique wooden flutes. I do minor repairs, but will contract out more difficult projects like replacing missing blocks, fabricating keys, or repairing cracks through the embouchure. I played three of my antique flutes on my most recent CD, A Stroll In The Park, and regularly play the old flutes at our local sessions. How does one discover traditional Irish music when ones Irish ancestors did not bring any music over and were too intent on surviving and assimilating to think of music? I first heard traditional Irish music in 1987 on the street in Copenhagen and immediately fell in love with it. Thank you, Henrik Bjørslev and Joakim Friis-Holm (Danish flute-harp duo). I later found that there were actually people in Houston who play traditional Irish music. I attended my first session in late 1990 and soon began the process of learning tunes and figuring out how to drive a pennywhistle. My luckiest day was in December 1991 when I met Therese Honey, wonderful harpist, my best friend and wife. We met at the studio of KPFT, the local listener-supported radio station, where I was volunteering. Our first date was to a concert by The Galveston Symphony. She was the harpist, and they performed Respighi’s ‘Pines of Rome,’ with its beautiful harp solo. Therese is an amazing musician. Few harpists can cover such a breadth of music genres. She has played pedal harp with the Houston Symphony, regularly performs and records on Celtic harp, plays medieval music with the group Istanpitta, and performs on Renaissance harp or baroque triple harp with Austin’s Texas Early Music Project. From my own perspective musically, she has been a source of guidance and encouragement in my musical progress. She encouraged me to take up flute and to start my first recording project. Her gentle suggestions over the years have helped me improve my rhythmic, intonation and phrasing skills. After playing whistle for about three years and often hearing master flute player Turlach Boylan at our sessions, I decided to see if I could learn flute. I bought an inexpensive bamboo flute and started huffing. After a few months I found I could actually play about 32 bars without getting dizzy from hyperventilation. I next bought a keyless rosewood flute by Ralph Sweet. After another year of practice and slow improvement I commissioned an eight key Rudall Rose model from Chris Wilkes. This flute is still the one I prefer for playing with diatonic instruments like the harp. Later I was able to add an Olwell keyless Pratten model. Lucky timing on both. The prices and wait times of these master builders have since increased several fold! By 1998 I was confident enough to think about recording some of my original tunes. The result, ‘Til Time Is No More, is a good a snapshot of myself and the Irish music scene in Houston at the time. It features several of the top Houston musicians and includes three great vocals by the talented Lara Bruckman. My new CD, A Stroll In The Park, recorded some 14 years after the first, is a solo flute project, with guitar or keyboard accompaniment, and features more of my original tunes. Music is in my genes. My Irish-Italian grandmother loved orchestral music and operetta. She would often sing a few of the tricky lines from Gilbert and Sullivan’s H.M.S. Pinafore with a twinkle in her eye. Dad was an excellent tuba and baritone horn player through college. Mom would occasionally sing a few of the Appalachian songs she had learned from her mother who grew up in rural Kentucky. One afternoon when I was 5 or 6 years old, Dad came home from work to find me listening to one of his 78 rpm records of a Schubert symphony. At first he was angry that I might have damaged his collection of orchestral recordings by not changing out the steel “needle” or stylus often enough. (The steel “needle” on phonographs was later replaced by the diamond tipped stylus that lasted much longer). After I assured him that I had changed it out properly after every 10th record, he was relieved. Then he realized what I had said… “What all did you listen to today?” he inquired. “All but these two albums,” I answered. It was 5 P.M., and I had been listening since about 10:00 that morning, growing more and more intrigued as I began to hear the music in more depth. At age 12 I began clarinet, and continued on clarinet and saxophones through college. I was the concertmaster and first chair clarinet for the 1959 Tennessee All State Band. For three or four years I was first chair clarinet in the Memphis Youth Symphony and the Memphis Youth Concert Band. In 1961 the band won first place at a national competition in Chicago. In 1958 I wrote an original Alma mater for my high school, which at the time was so new that they had adopted only a fight song. The Alma mater is still being played and sung there today. In 1957 – 1959 I played saxophone in our high school jazz band. This was a time when few colleges even had jazz programs. Our lead trumpet went on to make his living in Nashville’s recording and jazz scene and is still playing and leading jazz in Nashville. Good on ya’, George. I also played sax briefly in a rock and roll/R&B band that was led by my high school friend, the late Jimmy Dickinson. A form of dyslexia kept Jim from reading sheet music, much to the dismay of his mother, who taught classical piano. Jim could, however, pick up licks really fast. Jim was given a few free lessons in honky tonk piano by his family’s landscape realization engineer (Jim called him the ‘yard man’), who overheard Jim pounding away one day. Jim picked it up so fast he was soon taken down to Beale Street to study with and play with the more advanced masters of the art. Jim went on to a career in rock and R&B, as a pianist, producer and recording engineer. He is probably best known for his collaborations with Ry Cooder on a couple of film scores and for his inspiring piano work and arranging on Bob Dylan’s 1997 Grammy Award winning album, Time Out Of Mind. 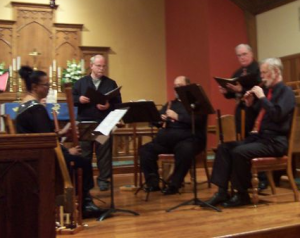 Left: Collegium Mysterium in concert at St. Andrews Episcopal Church, mid 2000s. Right: Passing Measures at the 2005 Texas Renaissance Festival. In graduate school I learned to play the baroque recorder so I could join a group in the Vanderbilt Physiology Department who played baroque duets and trios during Thursday lunch breaks. I have played and studied recorder sporadically since then. For seven years in the mid 2000s, I played Renaissance flutes and recorders with Collegium Mysterium, an eight piece vocal and instrumental ensemble who performed four concerts a year of Renaissance polyphonic music. 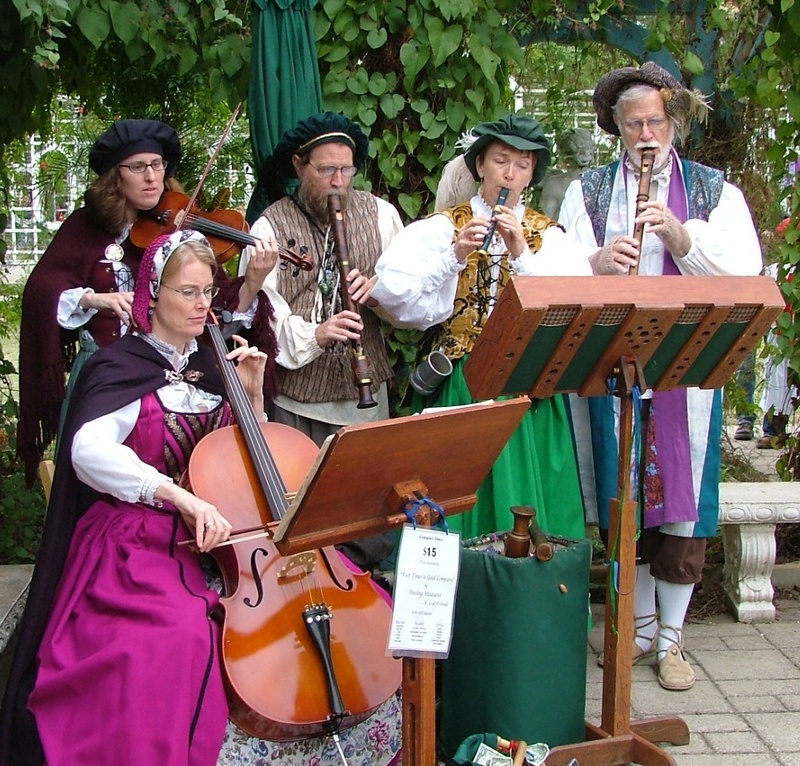 I also played recorders for a few years at the Texas Renaissance Festival with Istanpitta and with Passing Measures. I have much respect for the virutosos of baroque recorder and baroque flute. Both are incredibly difficult instruments to master. Music in any form is good for the soul and good for the mind, if not good for the pocketbook. Doesn’t matter. I’ll keep playing, thank you!